HOW LONG HAVE YOU WORKED AT JARRODS? At the moment my typical day involves communicating with our regional designers and assisting with any technical questions which may arise from a clients consultation. Also producing 3D models using our specialist software tailored for staircase manufacturing. WHAT’S THE BEST THING ABOUT WORKING AT JARRODS? 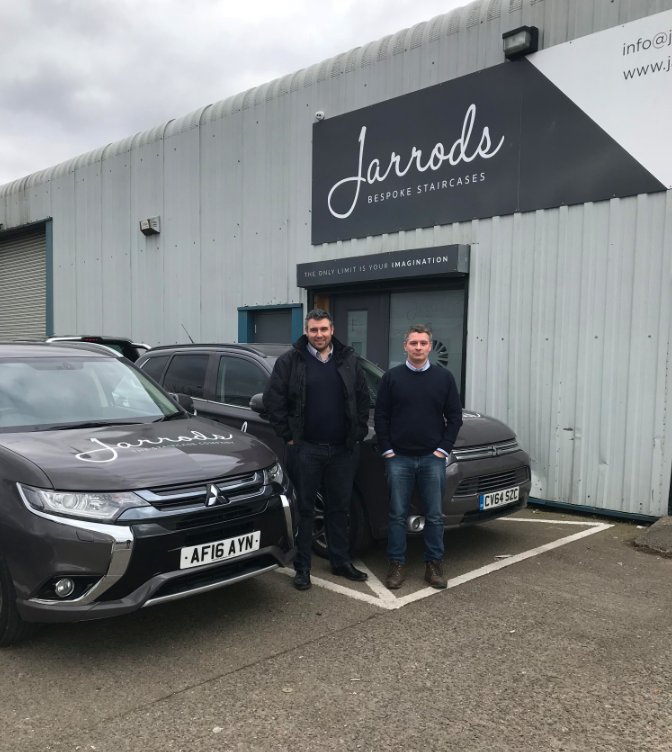 During my first week at Jarrods I have been made to feel welcome by all the team, and have felt a real sense of passion from everyone who works within the company to create stunning bespoke staircases. WHICH PROJECTS ARE YOU MOST LOOKING FORWARD TO? We currently have lots of really exciting projects on the go and I hope to contribute towards these. Going forward I would like to use my previous design experience with helical staircases and mix that with the stunning staircases Jarrods already produce to create truly innovative designs. Relaxing and spending time with my family, in particular weekends away at out caravan in New Quay west Wales. And supporting the greatest football in the world….. Arsenal. TELL US ONE SURPRISING THING ABOUT YOURSELF? I used to work in a bakery making cakes before I started working in the Joinery trade. JUST FOR FUN, TELL US YOUR FAVORITE FILM, BUT REPLACE ONE WORD WITH SOMETHING RELATED TO STAIRS! Darren (Right) and our Head Surveyor Paul with their new Electric Mitsubishi outlanders!